A youth organisation working with children & young people from 5-18 in Blairhill/Dundyvan Parish Church, Coatbridge. 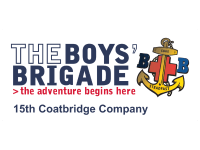 Meeting through the school term, Boys will enjoy an action packed programme of games, crafts and sports. Through this, they develop skills, make new friends, and most importantly, have fun! All three sections meet in the church hall on a Friday evening. Our Anchor Boys (P1 - P3) meet from 6:30 - 7:30. 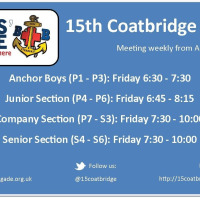 Our Junior Section (P4 - P6) meet from 6:45 - 8:15. Our Company & Senior Sections (P7 - S6) meet from 7:30 - 10:00.